Melissa Raine is a research associate in the School of Culture and Communication at the University of Melbourne. 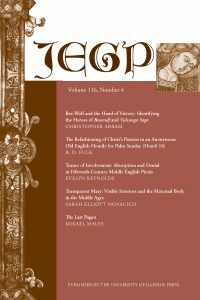 She recently shared her thoughts on her article, “Humor and Humoralism: Representing Bodily Experience in the Prologue of the Siege of Thebes” from an issue of the Journal of English and Germanic Philology. Hunger and satiety might be universally experienced sensations, but the meanings attached to them vary across time and culture. While the physical consumption of food affects the biological body, eating usually also involves social co-operation. What, where and how one eats almost inevitably expresses social relationships, and, it can be argued, the place of the consumer within these relationships contributes to that individual’s embodied sense of self. When descriptions of eating find their way into literary texts, those elemental bodily sensations are brought into the arena of language, where the meanings associated with eating can be intensified, explored, and organised into discursive registers. In my own reading practice, literary reference does not “replace” bodily experience, but invokes it in the reader. When reading texts from the medieval period, modern readers need to be highly alert to their own culturally ingrained beliefs about eating in order not to misread how those cues might make sense to medieval audiences. My cautionary tale is the body humor of the fifteenth-century Prologue to The Siege of Thebes. The author, John Lydgate, who was a Benedictine monk, presents himself as an extra pilgrim in Geoffrey Chaucer’s Canterbury Tales. Lydgate’s Prologue is often considered to be an unsophisticated imitation of Chaucer’s low style, his crass jokes about over-indulgence in food dismissed simply as poor writing, and the relevance of contemporary anti-monastic sentiment uncertain. I find that competing claims over the body of the Prologue’s Pilgrim-Monk are implicit in those jokes. They cohere into a sophisticated assertion that secular interference in monastic business is as inappropriate as the Prologue’s preoccupation with excessive consumption. The Prologue is a much richer text when its evocations of greed, indigestion and flatulence are freed from modern prejudices about “meaningful” embodied experiences to participate in a purposeful critique.